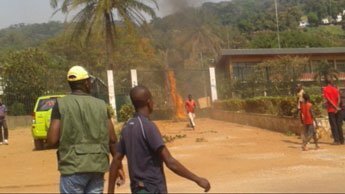 France’s President Francois Hollande has ordered tighter security for his country’s embassy in the Central African Republic (CAR), after it was attacked by protesters. Francois Hollande also told the defence minister to provide extra protection for French citizens there. Demonstrators threw stones at the embassy in the capital Bangui and tore down the French flag. They want France to help quash a rebellion in the north of the country. France, the former colonial power in the CAR, has about 200 soldiers based there, and the government in Bangui has appealed for France to intervene against a rebel movement which has taken several northern towns. The protesters said France had abandoned them. Protests were also staged outside the Air France office in the city. The French ambassador has complained to the government over the incidents. France Hollande said he had ordered Defence Minister Jean-Yves Le Drian to take “all necessary” protective measures to guarantee the security of the embassy. The Defence ministry said the embassy perimeter had been secured with the deployment of French troops. Analysts say Paris is increasingly reluctant to interfere in its former colonies and a spokesman for the French Foreign Ministry told Reuters news agency the crisis needed to be resolved through dialogue. Rebels in northern CAR on Sunday captured the key city of Bambari, the third largest in the country, having earlier seized the rich diamond mining area around Bria. The rebels – known as the Seleka coalition – accuse President Francois Bozize of failing to honor a 2007 peace deal, under which fighters who laid down their arms were meant to be paid. Seleka, which is made up of breakaway factions from three of the former armed groups, has pledged to depose Francois Bozize unless he negotiates with them. They began their campaign a month ago and have taken several towns in their push towards the capital. It is unclear how far they have advanced towards Bangui, but an unconfirmed report by Reuters news agency on Sunday quoted sources saying they were only 75 km (47 miles) away. President Francois Bozize, who seized power in a coup in 2003, has repeatedly relied on foreign intervention to fend off rebellions and the spill-over from conflicts in neighboring Chad and Sudan. Chad has deployed 150 soldiers to try to stem the rebel advance. The United Nations has ordered all its non-essential staff to be evacuated due to the worsening security situation.